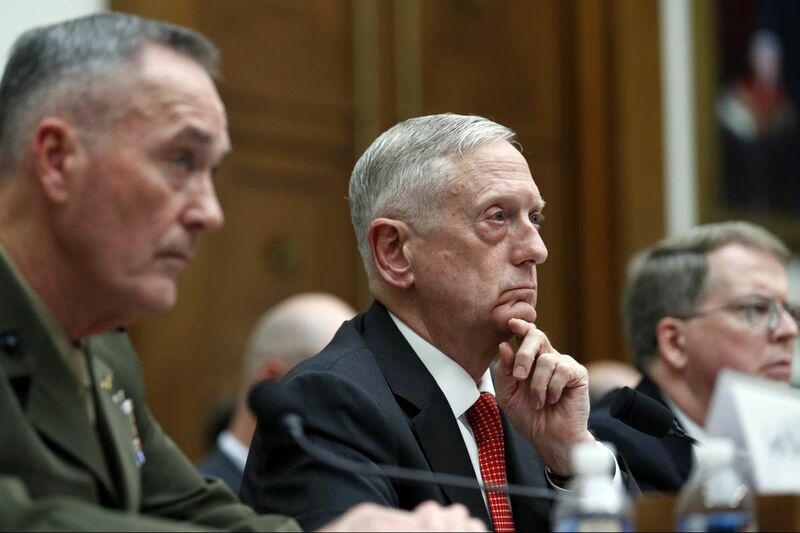 Joint Chiefs Chairman Gen. Joseph Dunford (left), Defense Secretary Jim Mattis, and Defense Under Secretary David Norquist at a House Armed Services Committee hearing. A future trivia question and historical footnote, the spectacular 10-day flameout of Anthony Scaramucci qualifies as the most entertaining episode yet of the ongoing reality show that is the Trump presidency. (Working title: "The Pompadours of 1600 Pennsylvania.") But even as the cocksure sycophant's gobsmacking spectacle stole the show, something of real importance took place a bit lower on the radar. Well, not directly — that's insubordination — but with rather elegant circumspection. The president tweeted out a total ban on transgender people serving in the military. It came practically out of nowhere. The military brass, not consulted, was not amused. Defense Secretary James Mattis, in the middle of a six-month review of the issue, was reportedly appalled. In other words, the military told the commander-in-chief to go jump in a lake. Generally speaking, this is not a healthy state of affairs in a nation of civilian control. It does carry a whiff of insubordination. But under a president so uniquely impulsive and chronically irrational, a certain vigilance, even prickliness, on the part of the military is to be welcomed. Trump's relentless public humiliation of Attorney General Jeff Sessions was clearly intended to get him to resign. He didn't, in part because of increasing support from Congress. Sessions' former colleagues came out strongly in his defense and some openly criticized the president's shabby treatment of his first and most fervent senatorial supporter. Indeed, Chuck Grassley, chairman of the Judiciary Committee, warned Trump not to fire Sessions because he wouldn't get another attorney general: The committee's entire 2017 schedule was set and there would be no hearings to approve a new AG. That was a finger to the eye of the president. Every once in a while, the Senate seems to remember that it is a coequal branch. Nonetheless, the stunning Senate rejection of repeal was also a pointed rejection of Trump's health-care hectoring. And a show of senatorial disdain for Trump's craving a personal legislative "win" on an issue about whose policy choices he knew nothing and cared less. In a rebuke not as earthshaking but still telling, the chief executive of the Boy Scouts found it necessary to apologize for the president's recent speech to their quadrennial jamboree. It was a wildly inappropriate confection, at once whining, self-referential, partisan, and political. How do you flub a speech to Boy Scouts? No merit badge for the big guy. In an address to law enforcement officials, Trump gave a wink and a nod to cops' roughing up suspects. Several police chiefs subsequently reprimanded Trump for encouraging police brutality – a mild form, perhaps, but brutality still. Press secretary Sarah Huckabee Sanders said it was all a joke. Nonsense. It was an ugly sentiment, expressed coyly enough to be waved away as humor but with the thuggish undertone of a man who, heckled at a campaign rally, once said approvingly that in the old days "guys like that" would "be carried out on a stretcher."